Every now and then the UU Fellowship holds a Silent Auction. We are starting to organize the most joyful one ever. To prepare for this great event, please hold onto really wonderful things that can be put in the auction. While you are KonMarie-ing or Swedish Death Cleaning keep some of the wonderful stuff for the auction. Or consider providing a service that could be bid on. You can also bring plants or veggies starters to add to the plants for sale. Email stewardship@uulacrosse.org if you’d like to donate an item, service, or have any questions! View items available on the day of the Auction click here. For more information head to the Facebook Event page (coming soon). 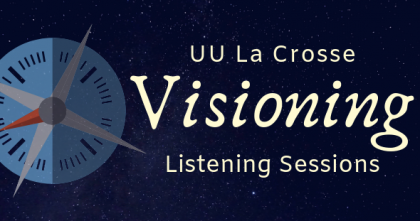 The Visioning Team is excited to announce “Listening Sessions” in April and May. We hope to hear from everyone in the fellowship, including Non-Members. Every contribution is important. There will be 3 ways to participate, including potluck dinners in private homes, lunch gatherings after services and speaking individually to a visioning team member after services. Sign-up sheets for the dinners and lunch gatherings will be available in the coffee area. Childcare will be available at some sessions. Please plan to share your vision for the fellowship. The Listening Session Potlucks and Focus Groups will be responding to 5 questions about how we see the future in 5 years. Your voice matters! If you have questions, or will not be at a service in the near future and need another way to sign up, contact Cindy Ericksen at cindyericksen@gmail.com. Find a list of dates for after-service Sessions and Potlucks here. A few fellowship members have created an Our Whole Lives (OWL) taskforce to bring OWL curricula to our fellowship. We hope to start with classes for grades K-1 and 4-6, and eventually offer classes for grades 7-9 and 10-12 as our current students age and/or that population increases. These classes are held separately from Sunday RE classes. Our timeline is late winter/early spring of 2020. You do not need to be a member to participate. For questions, more information or to get involved, please contact Tiffany Brubaker at tiffany.brubaker@gmail.com. The La Crosse Jail is committed to providing spiritual programming for a diverse population. Rev. Taves has offered to provide a Mindfulness Meditation during her week in La Crosse. Jail policy requires that there always be two people present in all services provided to the residents. If you would consider joining Rev. Taves to either help facilitate a mindfulness meditation or simply accompany her, email revkristataves@gmail.com. Friendly reminder not to park in our neighbor’s lot to the South of our building. Anything directly behind our building is open for UU La Crosse visitors. As always, if you are able, please park on a neighboring street. The UU Guilt-Free Craft Group is in the planning stages. We will meet regularly to knit, crochet, sew, bead, chat, snarf cookies, and whatever else we call “crafting.” Sewing machines and comparatively quiet electrical tools are welcome. Band saws might be a problem. As usual, no guilt, no pressure. Everyone welcome. If you’re interested in joining search for our Facebook group: UU Guilt-Free Craft Group. The caregiver can offer support to those in need by sending a card, making an announcement during Joys and Concerns, and/or publicizing your status and needs via the weekly emails. Let us know the level of care you desire. You may reach the caregiver at caregiver@uulacrosse.org or leave a message attn: caregiver at (608) 796-9993. CURRENT NEEDS: Women’s and men’s underwear and undershirts (medium and large), heavy-duty socks for men and women, deodorant, razors, toothpaste, toothbrushes, individually wrapped snacks, full-size containers of shampoo, conditioner, body wash and lotion, toilet paper. More information about our Collection Box can be found on our website, in E-News or please email Ellen Severson at EllenQofSheba@gmail.com. Keep Calm- Join the Choir! Fact: Singing in a choir improves breathing, posture, mood, blood pressure, brain power, immune system, and energy. Rehearsals are twice per month, on the first and third Wednesdays September- May at 8:45 am on Sundays the choir sings. Email choir@uulacrosse.org for more information. Past services are available for listening online via our SoundCloud page. Visit www.soundcloud.com/uuflacrosse to catch up on Sunday Services from the UUF of La Crosse.